The parking lot in the Flying J, Brookville, PA where we spent last night was packed this morning. I felt guilty about taking up a space intended for an 18 wheeler. Breakfast at Denny's, then on the road for an almost uneventful travel day, traveling due east all day. 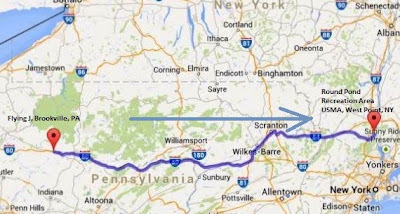 We finished crossing the eastern half of Pennsylvania and into the southeastern tip of New York state, finishing up at West Point, NY about 50 miles north of New York City on the banks of the Hudson River. 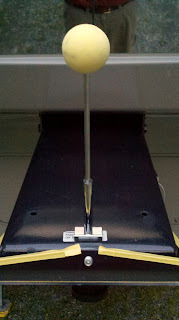 Our statistics were: Start 0800EDT; End 1445EDT; Miles 310.6; Elapsed Time 6:45; Average Speed 46mph. I know this stuff doesn't interest anyone, but here is a convenient place for me to record this navigation trivia. I said "almost uneventful". The campground is in the mountains -- hills by western standards. The last mile was a winding switchback from the highway up to the campground. It was a white knuckle mile with great fear of meeting an oncoming vehicle. It reminded me of the entry road to Black Hills Wild Horse Sanctuary except this one was paved and surrounded by forest. 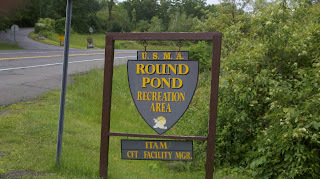 Round Pond Recreation Area is located in a rocky, woody area, just three miles from the United States Military Academy. 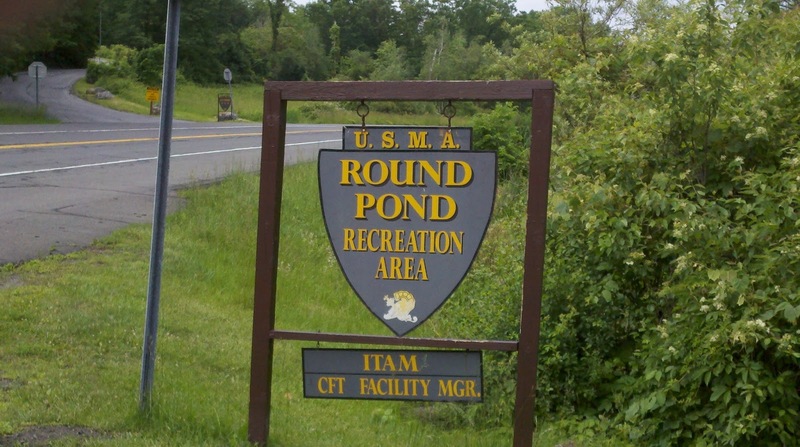 Round Pond is a clear mountaintop lake surrounded by a beach, playground, picnic areas and campsites. Here is some background on the Catskill region from Wikipedia. The Catskill Mountains are a large area in the southeastern portion of the U.S. state of New York. They are located approximately 100 miles north-northwest of New York City and forty miles southwest of Albany, starting just west of the Hudson River. The Catskills occupy much or all of five counties (Delaware, Greene, Schoharie, Sullivan, and Ulster). As a cultural and geographic region, the Catskills are generally defined as those areas close to or within the borders of the Catskill Park, a 700,000-acre (2,800 km2) forest preserve protected from many forms of development under New York state law. Geologically, the Catskills are a mature dissected plateau, a once-flat region subsequently uplifted and eroded into sharp relief by watercourses. The Catskills form the northeastern end of, and highest-elevation portion of, the Allegheny Plateau (also known as the Appalachian Plateau). Although the Catskills are sometimes compared with the Adirondack Mountains further north, the two mountain ranges are not geologically related, as the Adirondacks are a continuation of the Canadian Shield. Similarly, the Shawangunk Ridge, which forms the southeastern edge of the Catskills, is part of the geologically distinct Ridge-and-Valley province, and is a continuation of the same ridge known as Kittatinny Mountain in New Jersey and Blue Mountain in Pennsylvania. Climatically, the Catskills lie within the Allegheny Highlands forests ecoregion. The Poconos, to the immediate southwest in Pennsylvania, are technically a continuation of the Catskills under a different name. The Catskills contain more than thirty peaks above 3,500 feet and parts of six important rivers. The Catskills are well known in American culture, both as the setting for many 19th-century Hudson River School paintings and as the favored destination for urban vacationers from New York City in the mid-20th century. The region's many large resorts gave countless young stand-up comedians an opportunity to hone their craft. In addition, the Catskills have long been a haven for artists, musicians, and writers, especially in and around the towns of Woodstock and Phoenicia, New York. Lots more information on the history and cultural impact of this region available elsewhere for those interested. Go find it and enjoy. The day broke crystal clear and cool; a welcome relief after the muggy weather of earlier this week followed by a couple days of very serious storms that killed a few people on the east coast. We were in pretty good shape for an easy morning and early departure. Yesterday was the big day of activity knocking the last chores off the "to do list". There are still a lot of things undone in the house but they moved from the "to do" list to the "ain't gonna happen" list. Nevertheless we had three lists to work off. First was the "Get Out Of Dodge" list. That is my list of things that need to be done for us to leave the house securely and comfortably. It has four columns -- Cougar, Truck, House, Other. Yesterday we got rid of the biggest item in the other column when Michelle finally got cleared by Dr Shannon (our dentist). She has been wrestling with a long series of dental appointments that just would not end. She broke clear yesterday. The remaining items on the Get Out of Dodge list have to do with final preparation for departure during the last five days. We know about these way in advance so there are no surprises -- just step by step activities to move out of the house and into the Cougar. This time we had another list to work off at the same time. This one I named "Show Prep". It is the list we use to get the house ready after a short notice call from the real estate agent for a showing to a potential buyer. This list includes tidy up items we can accomplish in less that an hour. Going through that ckecklist assured us that we left the house ready for the agent. The only thing the real estate agent has to do is turn on the lights and the air conditioning. The third list is the one we use to close up and hitch up the Cougar whenever we leave a campsite. All said we felt pretty good about being ready to leave early with no last minute hassle. Dave and Jennifer Bennett stopped by to wish us well in our travels. 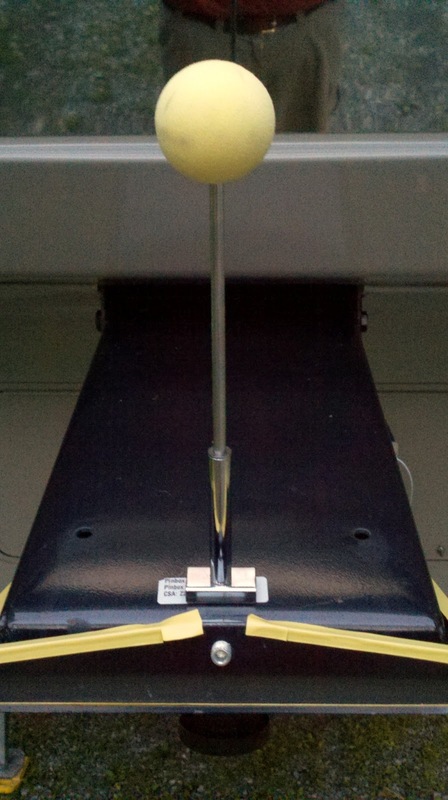 Dave always tries to be helpful and this time he presented me with the gadget in this picture to help align the truck and trailer for hooking up. I didn't get to use it this morning but I will try it during our next hook up. Judy Hobbs also came over to say goodbye. She and Michelle had a nice conversation of well wishes and promises to stay in touch and keep her informed about our adventures. 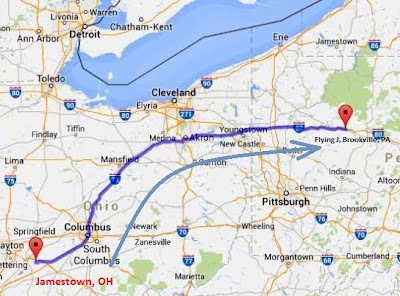 All check lists complete and social obligations fulfilled, we got on the road at 0906 EDT and traveled 321 miles, northeast then east, in 7:41 making our average for the day 42 mph. We arrived here at Flying J at 1647 EDT. The trip included two gas stops and was uneventful. I love uneventful travel days. We checked in at the store counter about overnight parking. The manager was OK with it but seemed a bit surprised. When we looked over the RV parking area I could see why. This Flying J facility is on a hilltop so there is not much level space. The few RV spaces are in the middle of a high traffic area and uncomfortably sloped. We would be rolling out of bed all night. So we opted for a space in a far corner of the truck area. Pretty flat but noisy as most truck parking areas are. We had dinner at Denny's in the Flying J where we will spend tonight. Denny's is Denny's. Not much more to say. When we “Blacktop Boondock” like this, I try to avoid unhitching. So we eat where we are and it is what it is. The truck area filled up rapidly as the end of the day approached. By bedtime there was not a parking space to be had. I wondered if we might be thrown out as being unwelcomed guests occupying a trucker’s space. No problem. The hum of idling diesel engines did not penetrate our Cougar and this busy place settled into its late night rhythm of a few night time drivers gassing up and moving on, while others had settled in to their sleepers for the night. We slept well and the night was uneventful. This Flying J is one of the sites covered in the website "Overnight RV Parking" to which I subscribe. I will log in and update their listing and hopefully get a few week extension to my subscription which will soon run out. I get quizical looks when I say that. So here goes. Start with planet Earth and zoom in on the continent of North America. Then scroll to the Atlantic Ocean side of North America. 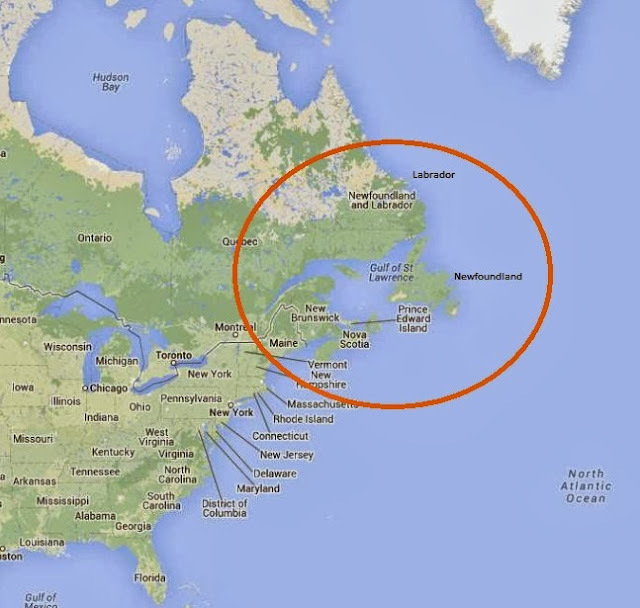 Next look around the border between the US and Canada and look at all that land stuck out in the Atlantic Ocean. Those are the Maritime Provinces ... almost. New Brunswick, Nova Scotia, Prince Edward Island are called the Maritime Provinces. For some reason the province of Newfoundland/Labrador is excluded. I don't know why. Be that as it may, our caravan will travel to New Brunswick (twice–in and out), Prince Edward Island, Nova Scotia, and Newfoundland; but not Labrador.